The 21st Century Housewife: To Do or Not To Do? That is the Question. Ever made a To Do List? I avoid them like the plague. There is something terrifying about actually writing down all the things I need to do. I’m afraid that the list would get so long, it might take on a life of its own and devour me. Besides, it’s kind of fun to sail by the seat of my pants, trying to remember all those things I really ought to be doing. Usually they pop into my head just as I’m starting one of the jobs that would be on my To Do List (if I had one actually written down). I then promptly forget exactly what it was I was about To Do, only to start doing the thing I’ve just thought of. But then the same thing same thing happens again, and I end up starting something else. It’s a vicious cycle and not usually a very productive way of working. 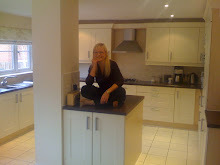 As a result, I still have not got on top of the clutter in our new house. I can’t even really call it new anymore as we have been here over a year. And yet I still have not gone through everything and got it sorted out. We have some rooms that are beautifully organised, but they are few and far between - and the study in particular (that is the room pictured above) is a sore point that is beginning to irritate not just me, but the 21st Century Husband as well. And if it is irritating him, it has to be bad - it takes a lot to irritate the 21st Century Husband. You see, although I have my library upstairs to work in and the study is supposed to be for the 21st Century Husband, we have both recently found ourselves working in the dining room as there is no room in either the study or the library. The study is filled with clutter, and the library has the clothes horses on which I am drying our freshly washed clothes in it. (All this environmental friendliness is killing me. I may soon have to start using the tumble dryer every day.) As a result, there are now papers spread all over the dining room table, in the room that actually faces the front door. Not good. Yes, that’s right, sub-sections. Because there is no way ‘Sorting the Study’ is one job. If it were I’d go in there and not come out till Christmas. It is not just my paperwork in there, it is seven years worth of my poor parents’ paperwork as well. When they died last year, I brought it all back home with me and every time I touch it, it makes me sad. So I leave it alone. I’ve just sorted out the stuff I really have to, for taxes and things. Not good. The cloud of sorrow looming over “the stuff” is beginning to live and breathe. I would need to divide the To Do list (if I had one) into smaller chunks so it looks something like this. The problem, I have realised, is that I don’t just have clutter, I have metaphysical clutter. And that is the very worst kind. Metaphysical clutter is heavy - not just physically but emotionally. We moved in such a rush, at such a horrid time - my Dad had just died and my Mother was dying - that I really cannot remember where anything is. I open drawers and am surprised to find things I have been looking for for absolutely ages - but I still can’t find my two handwritten recipe books that contain some of my precious family recipes. I remember clothes I know I have not given away and search for ages, only to give up when I simply cannot locate them. I cannot find the keys for two of my Dad’s strong boxes - but I have opened them since we moved so the keys are definitely here. It is driving me crazy. So today, I began - still sans To Do List - to work my way through some of the clutter - both physical and metaphysical - that is holding me back. And do you know what? Even without the To Do List, I really accomplished a lot. I started with the drawers in my bedroom, and cleared out three bags of old clothes that either don’t fit or were mistakes for the charity shop. (By mistakes I am referring to the fuschia yoga clothes I bought a year ago. The fuschia t-shirt and jacket are great, but the fuschia trousers - not so much. The biggest part of my body is my hips and you should never put a colour like that on the biggest part of your body.) Okay, I know, my bedroom is nowhere near the study, but it’s a start. And after I worked up my courage working on our bedroom, I did broach the borders of the study, throwing away an entire bag full of bits of paper I no longer need (believe me, I double checked!). So tonight I find myself exhausted, but somehow elated and also very sure of one thing. If I had written down everything I needed to do, I would never have had the courage to start. Sometimes To Do Lists are great, but other times, making them is a great excuse for not even starting. Sometimes you just have to get on with it. And for me, that time is now.